Please Read the Left Size Chart Image or pay attention to the detailed size info. We hope every client would pick out the most suitable clothes. Due to the measurements by hands, please allow 0.4-1.2" error, thank you for your kind understanding. Size chart: S--------Bust 43.31"----Shoulder 18.35"-----Sleeve 24.21"-----Length 53.54" M--------Bust 45.28"----Shoulder 18.82"-----Sleeve 24.61"-----Length 54.33" L--------Bust 47.24"----Shoulder 19.29"-----Sleeve 25.00"-----Length 55.12" XL-------Bust 49.21"----Shoulder 19.76"-----Sleeve 25.39"-----Length 55.91" XXL------Bust 51.18"----Shoulder 20.24"-----Sleeve 25.79"-----Length 56.69" XXXL-----Bust 53.15"----Shoulder 20.71"-----Sleeve 26.18"-----Length 57.48" XXXXL----Bust 55.12"----Shoulder 21.18"-----Sleeve 26.57"-----Length 58.27" If you have any questions, please do not hesitate to contact us, we will reply to you within 24 hours and give you help, thank you! ✿✿┄ 1.It is made of high quality materials,durable enought for your daily wearing ✿✿┄ 2.It protects you to keep away from cold. ✿✿┄ 3.Great for Work,Daily,Casual,I am sure you will like it! ✿✿┄ 4.It is made by a kind of comfortable material. ✿✿┄ Product information: ✿✿┄ Season:Winter ✿✿┄ Gender:Men ✿✿┄ Occasion:Daily,Casual ✿✿┄ Material:Polyester ✿✿┄ Pattern Type:Solid ✿✿┄ Style:Casual ✿✿┄ Sleeve length:Long Sleeve ✿✿┄ Fit:Fits ture to size ✿✿┄ Thickness:Standard ✿✿┄ How to wash:Hand wash Cold,Hang or Line Dry ✿✿┄ What you get:1PC Men Coat ✿✿┄ ✿✿┄ Size:S Bust:100cm/39.4" Shoulder:45cm/17.7" Length:92cm/36.2" Sleeve:62cm/24.4" ✿✿┄ Size:M Bust:105cm/41.3" Shoulder:46cm/18.1" Length:93cm/36.6" Sleeve:63cm/24.8" ✿✿┄ Size:L Bust:110cm/43.3" Shoulder:48cm/18.9" Length:94cm/37.8" Sleeve:64cm/25.2" ✿✿┄ Size:XL Bust:115cm/45.2" Shoulder:49cm/19.3" Length:95cm/37.4" Sleeve:65cm/25.6" ✿✿┄ Size:XXL Bust:120cm/47.3" Shoulder:51cm/20.1" Length:96cm/37.8" Sleeve:66cm/26" ✿✿┄ Size:XXXL Bust:125cm/49.2" Shoulder:52cm/20.5" Length:97cm/38.2" Sleeve:67cm/26.4"
Add a little victorian touch to any ensemble in this gothic-inspired tail jacket! 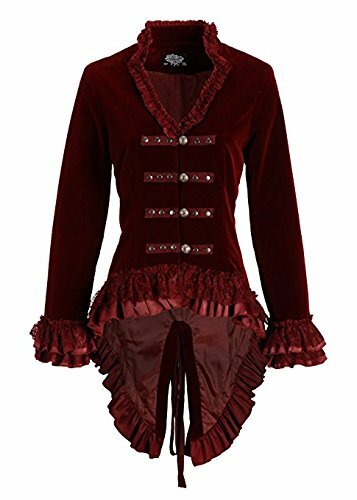 This elegant jacket is made out of lush burgundy velvet and features beautiful lacing in the back, stud decoration, ruffles on the seams and a decorative button closure in the front. Put it on and look wickedly awesome! Available in sizes US 4, US 6, US 8, US 10, US 12, US 14, US 16 and US 18. You'll look nothing short of royalty in this stunning burgundy velvet jacket! 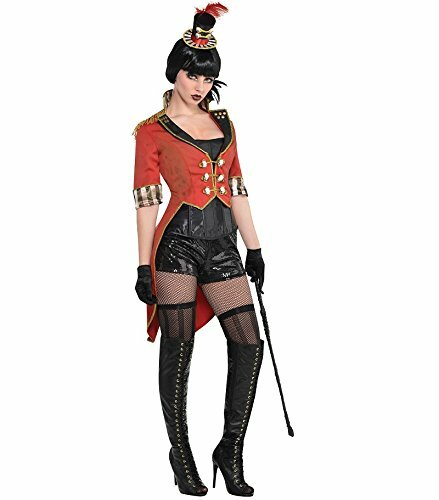 This Freak show vintage cropped Red ringmaster jacket is a scary twist to your women's circus ringmaster costume! 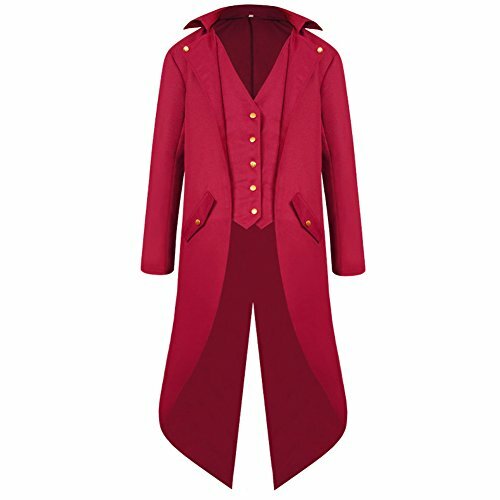 Featuring hand-stained fabric for a vintage feel, This Red tailcoat has skull buttons, gold epaulettes, striped satin cuffs, and flame detail on the wrists. Long coattails trail behind you, but the front is cropped to show off your figure. 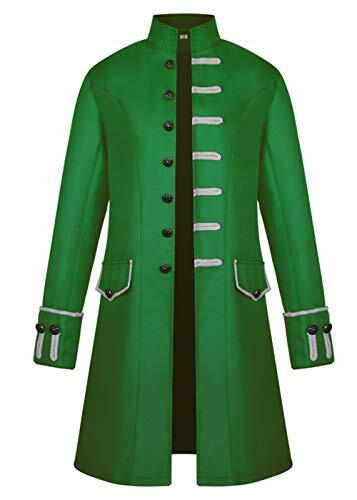 ★★★【Size】: The size of this coat is smaller than normal size, please choose one bigger size when you place the order. Thanks!!! 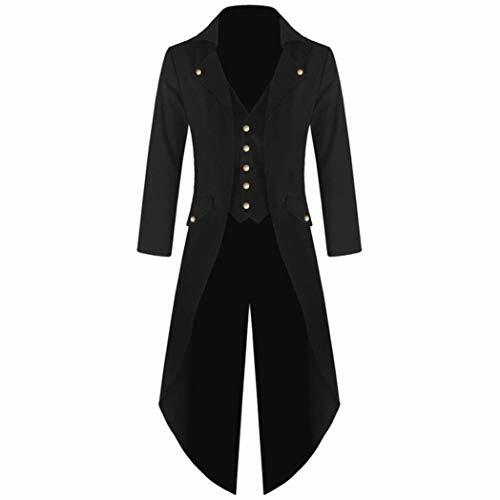 Mens Medieval Vintage Tailcoat Jacket Goth Long Steampunk Formal Gothic Victorian Frock Coat Halloween Costume Weight: About 0.5Kg Style: Halloween Costume Available Size: S, M, L, XL, 2XL Available Color: Purple, black, red, green, white, blue ★Note: Please choose the suitable size according to the above details, please don't believe the Amazon sizes. Because of the different measurement methods, there may be 1-3cm of the allowable range error. As different computers display colors differently, the color of the actual item may vary slightly from the above images, thanks for your understanding.